Before we get into what you've been working on since your feature on The Nice Niche, can you tell me about Garbage Painting #56? Is there a narrative behind "ants"? This is one of my favorites… At this point in the "Garbage Paintings" series I was following the trail of evolution and depicting each species that appeared on earth, in order. This was the ants painting. 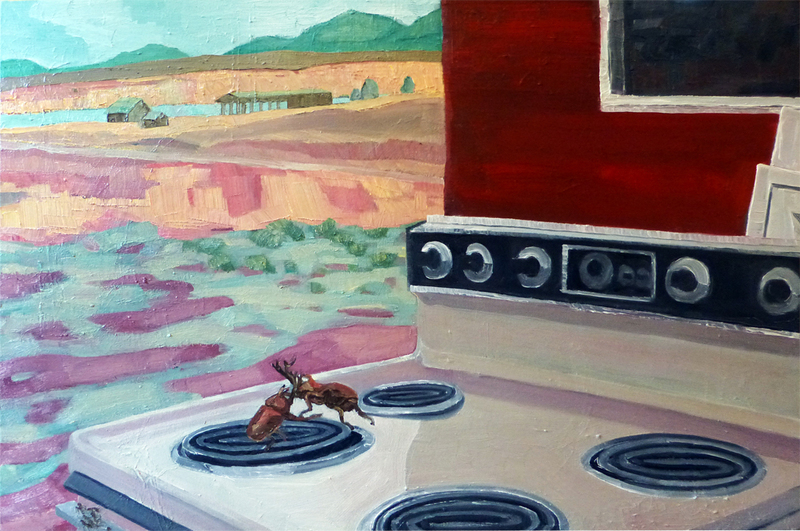 I had painted the beetle just before this one, but obviously wasn't quite through painting beetles. I really enjoy painting insects. Heh heh. People are animals. While I was painting garbage, I became more interested in the animals I was painting with the garbage than the trash itself. Instead of imagining static landscapes left behind by humans, I became more interested in exploring the relationship humans currently have with non-human animals. It's fascinating to me how the relationship we have with our fellow animals has evolved. Our healthy fear of snakes has been captured, defanged and turned into a tourist photo opportunity. I get most of my material from the internet, and am often taken aback by the photos I come across. I'll bet there was a time when you could feel pretty special for "wrestling" an alligator and getting a picture of it. Now, just search for "alligator wrestling" online and you'll come up with thousands of pictures of people doing the exact same thing at a place called "Gatorland". It has changed my approach to painting human portraits from rich and colorful to desaturated and zombie-like. And I often laugh at my own child-like depiction of non-human animals, revealing how much I romanticize the beasts.